Earthen mounds are raised banks or hills built by prehistoric humans almost entirely out of soil or earth. Found in many different parts of the world, these mounds vary in size and shape, and most were built by ancient peoples as burial places or to serve some ceremonial purpose. The greatest number and the most famous earthen mounds were built by early Native Americans. An earthen mound is an above-ground pile of earth that often looks like a large, rounded bump on Earth's surface or sometimes more like a normal, natural hill. Mounds still exist in many parts of the world and were usually built by humans long ago to bury their dead. Different countries and cultures call them by different names, and they range in size from a few feet or meters across to huge, pyramidlike structures that contain tons of earth. Although the earthen mounds found today in North America are similar to those discovered in Europe and Asia, these American mounds are so numerous and varied that the name "mound builders" has come to refer to those early Native Americans who constructed large monuments out of earth. Tens of thousands of earthen mounds can still be seen from the Canadian provinces of Ontario and Manitoba south to Florida, and from the Atlantic Ocean to the Mississippi River. They were built by several different groups of Native American people who may have lived as long ago as 1000 B.C. While these mounds take many forms and served different purposes, with each in a sense telling its own story, all were built entirely by hand, usually by piling up earth one basket-full at a time. Some served as burial mounds for the honored dead, while other flat-topped mounds were parts of large cities or towns and held temples or ceremonial buildings, and still others were built in the shape of giant animals. These huge, raised mounds are easily recognizable from the air and resemble the outline of a certain animal, like a snake, bird, or bear. They are called "effigy mounds" (pronounced EFF-ih-jee). Today we realize that the mound builders were not a single group of people, and that their mounds were not built only one way for a single purpose. native town he encountered had one or more of these high, artificial mounds. Over 200 years later, one of the first people to investigate these American mounds was Thomas Jefferson (1743–1826), who went on to become third president of the United States. Sometime around 1780, when Jefferson was governor of Virginia, he excavated or dug up and exposed some of the burial mounds in Virginia. Digging carefully, Jefferson approached this job as a modern archaeologist would, and although he uncovered many human skeletons, he was not searching just for buried treasure or ancient goods. Despite his belief that these mounds were the work of Native Americans, a myth soon grew up that they were instead built by some sophisticated lost people who had lived long before. This wrong notion persisted for quite some time, until it was finally disproved during the 1880s by surveying and excavating teams sponsored by the Smithsonian Institution. Their work eventually demonstrated that these mysterious mounds were the work of ancient Native Americans, and the mounds eventually came to be protected by state laws. One of the earliest groups of Native American mound builders was located in the Ohio River valley. Today, the people of this group are known as the people of the Adena culture. These people probably believed in some sort of afterlife because they conducted burial ceremonies and built mounds for their dead. Many of these began as single heaps of earth covered by simple monuments of stone and other materials. As bodies were later added to a mound, it grew in size, and sometimes special earth-covered log tombs were built to contain high-ranking tribe members. Often they would be buried with objects such as pipes, pottery, axes, and other gifts. 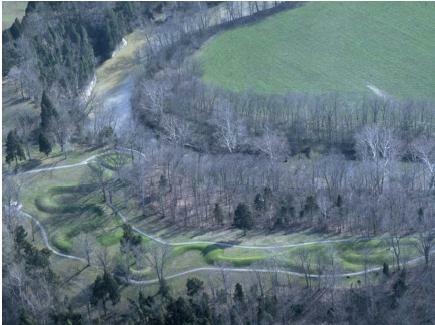 One of the largest Adena mounds, measuring about 70 feet (21 meters) high, is in West Virginia. The Adena people were succeeded by the Hopewell culture in what is now Michigan, Wisconsin, Ohio, Indiana, Iowa, and Missouri. This group is named after a farm in Ohio where about 30 mounds are located. The people of the Hopewell culture traveled and traded as far away as Florida, bringing back shark teeth and seashells to bury with their dead. They built more mounds than the Adena people, and the largest, in Newark, Ohio, includes a raised ridge that surrounds about 50 acres (20 hectares) of land. Their mounds almost always contained gifts for their dead. The Hopewell culture eventually declined for some reason, and they were succeeded by what we call the Mississippians, because these people made their mounds in the Mississippi valley. They were naturally more advanced, and built actual cities with many flat-topped pyramids. Their mounds served as foundations for temples or special buildings as well as for burial places. It is thought that they adopted many of the customs they encountered during their trade visits to Mexico. One of the largest mound sites in the United States is Poverty Point, near Epps, Louisiana. It may be 3,000 years old and probably served as a ceremonial center for the culture of the time. It consists of a group of six octagons (eight-sided shapes), spreading out one within the other, with the outer octagon having a diameter of about 4,000 feet (1,220 meters). The existence of these mounds tell us something about the people who built them, especially when they contain objects. Study and understanding of the mounds can tell us something about that group's society, or how they lived and what they were like. Most important, the mounds are proof that advanced cultures existed in ancient America long before the Europeans came. We now know that we should recognize and respect these cultures, preserving and protecting what they have left behind.